Summer days can either zip by or crawl by at a snail's pace. While my older two kids are at summer camp this week, I've been having fun with my toddler and preschooler. One of the activities I tried with my preschooler this week was LEGO I-Spy! 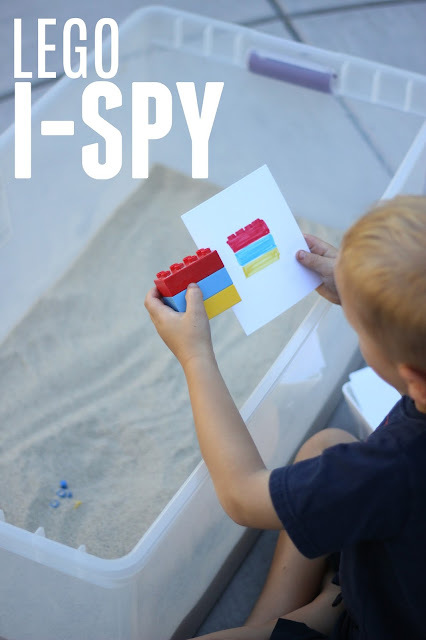 LEGO I-Spy uses only a few materials and you can do it with whatever type of LEGO or LEGO DUPLO bricks that you have. My son had fun playing this I-Spy game again and again. 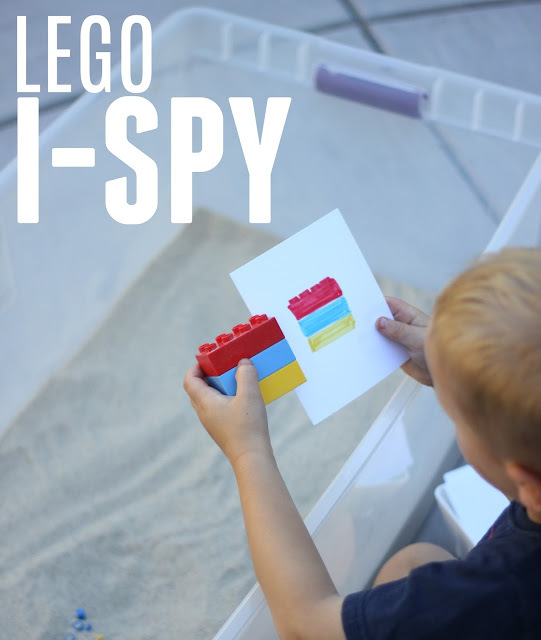 Start by hunting through your LEGO sets to figure out what pieces you want to use for I-Spy. Next, build anything you want and then draw a picture of each item that you build. I used markers to color mine in. Once you have several cards ready, you are set to play! To play I-Spy we went outside to my sand pit (you can really use anything in a sensory tub) and then I buried all of our LEGO creations in the sand while my son wasn't looking. Next, my son picked a picture of an object that we wanted to hunt for and he started digging! Once he found the correct item, we held it up next to our card to see if it was a match! We continued matching items to the cards until they were all found. Easy peasy lemon squeezy (is my favorite thing to say) when we finish up a game or a project and the kids had fun with it! Alright, now it is your turn! Do you have any other favorite LEGO themed games or activities we should add to our LEGO Week snack/lunch schedule? I am a retired K/1 teacher and I used Lego bricks in my classroom. "Copy Cat" was one of my favorite activities. Prepare bags of blocks containing exactly the same size, color, and type of bricks. Students play in pairs, each child with a bag. A partition is placed between the two students and one begins to build "something" describing the brick and giving directions on placement. The other child follows the directions to build an identical structure. Only verbal directions are used; no visual clues or help! This game demonstrates the need for giving clear, descriptive directions. It also improves listening and writing skills and is fun for all ages. I played it this week with my third grade grand-daughter and it took her 3 tries to give directions that were clear enough to produce the desired result. Although the bags contained 20 or so bricks, I limited the size of the structures to 10 or less bricks per round, due to time and the age of my students.